Pollinating the Peak is an ambitious natural heritage project based in Derbyshire that will raise awareness of the links between our countryside, food and bumblebees. Working with a wide range of partners across all sectors, we will engage with people of all ages and inspire a new generation of entomologists and citizen scientists to look after and look out for bumblebees now and in the future, taking action from planting pollinator-friendly flowers in their own gardens to carrying out bumblebee surveys. By inspiring public action the project aims to help secure the future of the Bilberry bumblebee (a Peak District National Park priority species) and other local bumblebees by improving favourable habitat and monitoring bumblebee populations. The PtP team gained a new member in April, our Education Officer Andy Benson, who has been working hard to continue the development and delivery of our Bumblebee Education Experience (BEE). We purchased some fantastic bespoke props from Amalgam Models for the science show element of the experience, as well as acquiring a vehicle to transport them and us around secondary schools in our project area, ready for our education program launch in October! 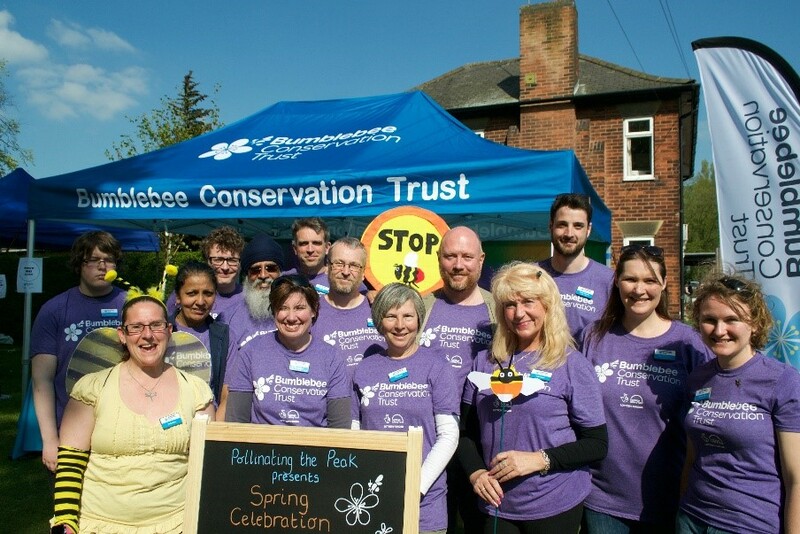 At our project launch in May, we gave away over 80 bee-friendly plants to start off ‘Chesterfield’s Bumblebee Network’ as well as running drumming workshops, creating a huge land art Bilberry bumblebee and parading our ‘Bumblebees on Sticks’ around the local park. Since then, we have all been working hard to engage a wide variety at audiences through series of events; from large-scale national occasions such as RHS Chatsworth, to smaller local festivals and fun days including Hathersage Gala and Superhero Picnics to local community. With the help of Science Manager, Richard, we have also delivered a number of bumblebee identification workshops, giving our volunteers, partners and the local community the skills they need to carry out bumblebee surveys in our project area. This autumn, we are looking forward to getting stuck in to more habitat work – creating and maintaining bilberry bumblebee habitat on the Peak District moorland – and of course, we can’t wait to begin delivering B.E.E. to secondary schools and inspiring the next generation of bumblebee scientists. Upgrade our Bee kind gardening tool that allows people to score their garden for its bee-friendliness. Deliver seed collection workshops and propagation training events, encouraging low-cost bee-friendly gardening. Create bee-friendly habitat on local authority, National Trust and Ministry of Justice land. Deliver a programme of bumblebee talks and guided walks, many led by volunteers. Work with secondary school teachers, students and University academics, to deliver an innovative pollinator education programme that will encourage more young people to study science at University. This includes The Bumblebee Education Experience (B.E.E. ): a free, curriculum linked, secondary education package which aims to conserve bumblebees in the Peak District and Derbyshire, engaging students through a science roadshow and hands-on workshops. BEE will travel to different schools engaging children across the county! Work with Universities to inspire the next generation of researchers through involvement in real science experiments within University labs. Deliver events at walking festivals, well dressings and food festivals. Create new outreach materials, including a bee-pollinated foods leaflet, bee-inspired recipe cards and a new ‘Bumblebee walks in Derbyshire’ booklet. Launch a series of pop-up Bee Hunt activities where people will follow clues to find bumblebee ‘treasure’ and facts. Culminate in a Bee Festival, linking with existing Peak District festivals. Recruit, train and support volunteers in collecting data about bees and their habitats. Deliver training in survey techniques; bumblebee ID; and a Train the Trainer programme to help volunteers train others. Chesterfield Borough Council, Chatsworth Estate, Derbyshire County Council, Derbyshire Wildlife Trust, Little Green Space, Moors for the Future Partnership, National Trust in the Peak District and Derbyshire and Peak District National Park Authority. We are delighted to announce, following a rigorous assessment during the summer of 2017, HLF awarded almost £720,000 for the delivery of the project over the next three years! HLF awarded an initial £150,000 to fund the development of the project. We would like to thank the following funders who have already pledged their support: Duke of Devonshire Charitable Trust, Gilchrist Educational Trust, Miss K M Harbinson’s Charitable Trust, Charles Wells, the Whovian Running Club, People’s Postcode Lottery, Diamond and Diamond Ltd, AO, Peter Samuel Trust, Spear Charitable Trust, John Lewis, Pauline Meredith Charitable Trust, William Dean Trust, The Ivo Trust, Reverence for Life UK, The Spear Trust, West Midlands Safari Park and Waterloo Foundation. We would also like to thank the Aviva Community Fund for supporting the project during the gap between the development and delivery phases.